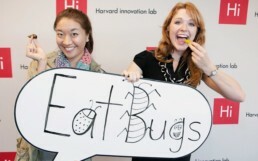 Chirps uses powder made from crickets to create tortilla-style chip snacks that are nutritious and eco-friendly. Using crickets milled into a powder to make tortilla chips, Chirps’ snacks are healthy and have a low environmental impact. The company’s tortilla chips, called “Chirps”, are made of chia seeds, corn, peas and cricket powder, and they come in three flavors: Cheddar, Barbeque, and Sriracha. With this combination of ingredients, the chips are low in fat, high in protein and also contain a number of other nutrients such as B12. Chirps recently came out with a cricket protein powder and in the future, the company plans to continue to expand its offerings and normalize cricket-based food as a healthy alternative to meat. Crickets are 70% protein, are high in B12, calcium, iron, and contain prebiotics that may improve gut health. Aside from being a healthier alternative, producing cricket powder is also good for the planet, as crickets are 12 times more efficient in converting feed to food than cattle. According to the Food and Agriculture Organisation of the United Nations (FAO), the livestock sector is responsible for 14.5% of human-induced greenhouse gas emissions. Embracing cricket protein is one way to reduce the environmental footprint of the food sector, as insects generate only 1% of the greenhouse gases that livestock produce. Chirps seeks to spur this shift by normalizing cricket consumption and showcasing insects as a healthy, affordable and sustainable solution. Insects are a readily available and under-utilized source of nutrients. By making chips, Chirps helps to normalize the use of insects in the food industry. High in protein, nutrients, fatty acids and fiber, insects help alleviate malnutrition. Chirps claim that their Chirps Chips contain three times as much protein and half as much fat as the leading potato chip. By using insects to make a flour alternative, Chirps Chips could help to reduce the demand for new agricultural land to grow traditional flour sources such as wheat. Chirps uses cricket powder to make a range of food products. Cricket powder is made from crickets that are dried and milled into a high protein powder. In college, Laura (a co-founder) was studying abroad in Tanzania and met a woman selling fried caterpillars on the side of the street. Despite being a bit hesitant, she bought one, bit down, and her first thought was, “Wow! This tastes like lobster!” When she returned to the US, Rose and Meryl jumped on board, and after a few escaped crickets in the dorm room later, Chirps was born.